The minutes for the July meeting got released yesterday, and the Greenback had a bearish reaction. What’s up with that? Well, let’s take a closer, look shall we? Fed officials talked about three specific global developments: (1) the Brexit referendum, (2) the Italian banking crisis, and (3) China-related developments. Finally, Fed officials talked a bit about China. And they zoomed in on the “uncertainty about the outlook for China’s foreign exchange policy, and the implications of China’s run-up in debt to support its economy.” Unfortunately, Fed officials didn’t share the specifics of their discussion on China. This discussion was in relation to the recent investor activity of buying up equities and CRE as a means to get higher yield in a world with low (and even negative) interest rates. And so far, there are no imminent signs of a real estate bubble or a potential stock market crash, according to Fed officials. There was also one member who voted for a rate hike then and there, “citing the easing of financial conditions since the U.K. referendum, the return to trend economic growth, solid job growth, and inflation moving toward 2 percent.” And we already know that the sole dissenter was Kansas City Fed President Esther L. George. In short, Fed officials were generally in wait-and-see mode. And as I noted in my write-up on the July FOMC statement, the lack of forward guidance back then eroded rate hike expectations, which caused the Greenback to slide. 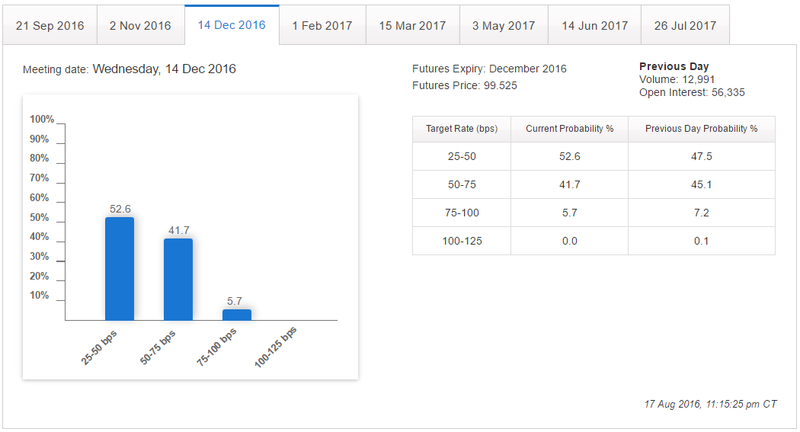 And looking at the CME Group’s FedWatch Tool, rate hike probabilities took hits across the board. The probability of a December rate hike, for example, dipped from 45.1% to 41.7%. The lack of forward guidance and the Fed’s wait-and-see attitude therefore apparently hurt rate hike expectations once more, which is probably why the Greenback tanked yet again. Given the Fed’s wait-and-see attitude, and mixed economic reports such as a stellar NFP report and a rather underwhelming Q2 GDP reading, do you think a rate hike within the year is still in the cards? Share your thoughts by answering the poll below!